Arguably the birthplace of liberal America, San Francisco has long been known for its counterculture, with this being the inception of hippie culture at infamous Haight-Ashbury. Before then it was a haunt for the writers and poets of the 1950s Bear Generation – or ‘beatniks’ – and even further in the past significant immigration of Chinese seeking their fortunes, gave rise to one of the most important Chinatowns in the world. San Francisco sure is cocktail of different cultures and ethnicities, booming from small ex-Mexican settlement to full-fledged town thanks to the mid-19th century California Gold Rush. Today the city of San Francisco is definitely an exciting place to visit, home to endless streets of cuisine and independent stores, leftfield art and internationally recognized tourists destinations. 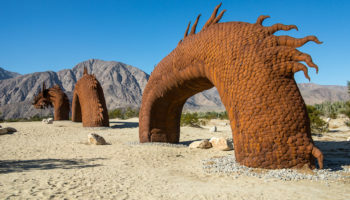 It’s here where you’ll find locals that range from the bohemian to the hipster, from the homeless to multi-millionaires, the population of a diverse and vibrant yet laid-back city that is rewarding in any of its must-visit areas, which take in chilled coastal areas as much as historic small lanes inland. 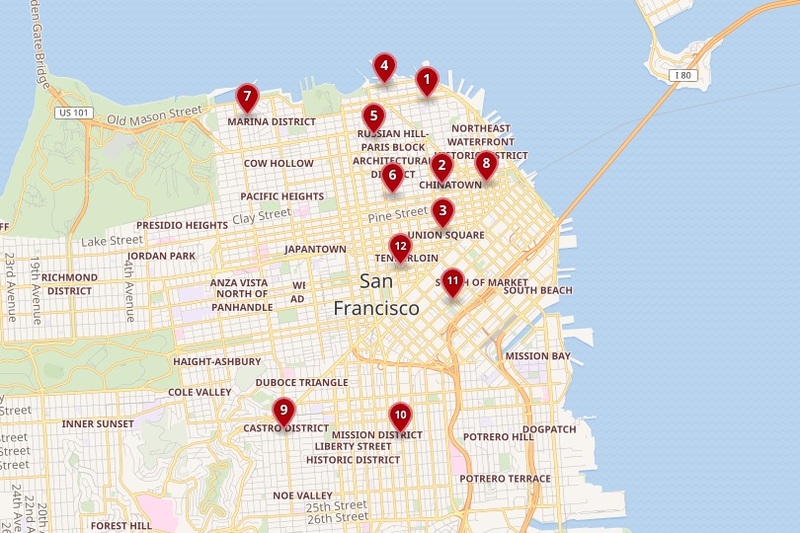 We’ve listed some of our favorite neighborhoods below to make it easier to decide where to stay in San Francisco. When it comes to diversity, this melting pot of an area is probably the most diverse in San Francisco. The heart of Little Italy is in North Beach, where it borders and mixes with Chinatown – Washington Square Park, with the Saints Peter And Paul Church on one side is the community center for local Italians, and is also used by older Chinese for tai chi every morning. It’s a true mix of cultures here, and staying here means rubbing shoulders with locals. For the hungry, there are a lot of Italian eateries in the area, from little cafes to full blown restaurants. One of these is Caffe Trieste, the most famous in San Francisco; previous frequenters of this cafe include Alan Watts, Vincent Price, Beat Generation writers Jack Kerouac and Allen Ginsberg, and Francis Ford Coppola – he wrote much of the screenplay for The Godfather whilst sat right in this spot. For more beatnik action check out City Lights Bookstore, a beat hangout, on Columbus Ave.
Hotel Boheme – This cool hotel is housed in a building that dates back to the 1880s. Needless to say, the atmosphere here is alternative, providing a cocktail of European influenced furnishings and decor, as well as historic photos decorating the walls. The rooms at this 3-star hotel are cozy; some of them even come with views of Columbus Avenue. 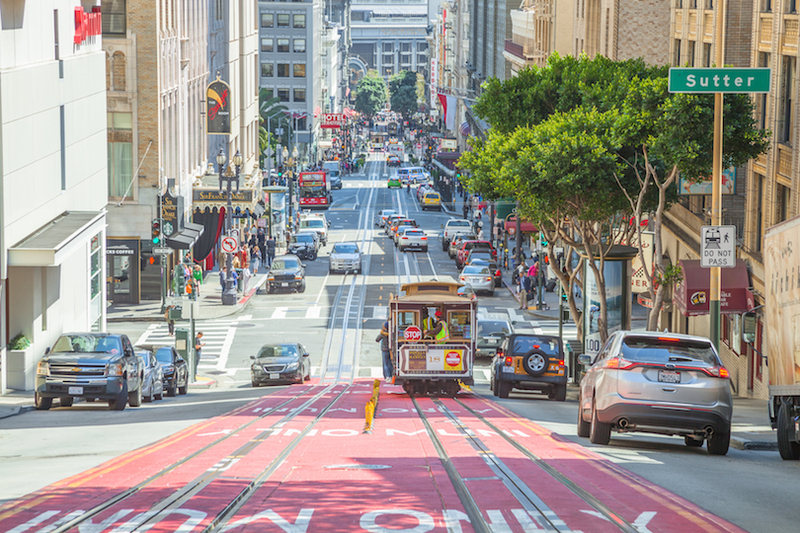 Getting around San Francisco is easy, thanks to the nearest Muni bus stop being a mere one minute walk away. There’s a pastry shop just downstairs, too! 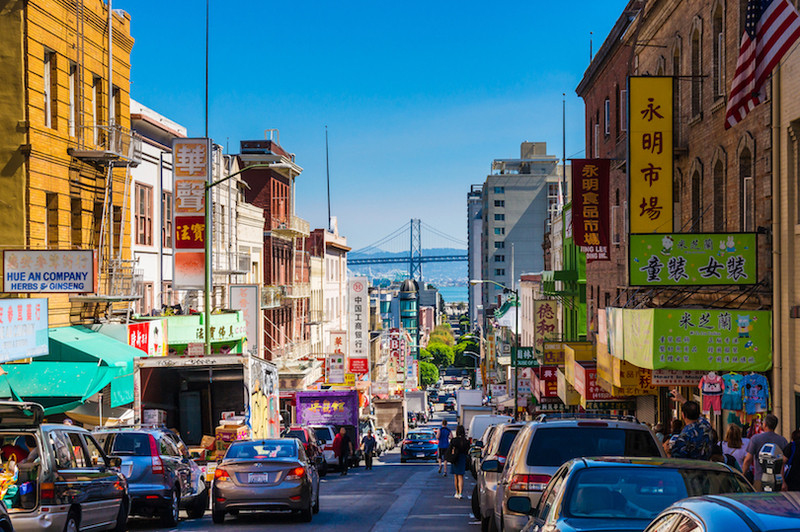 Whilst many cities in the world feature a Chinatown, this one in San Francisco is particularly worthy of mention: it is not only the biggest Chinatown in all of North America, but also the biggest single Chinese enclave outside of Asia. Established in 1848, this is in fact one of four Chinatowns located in the city, though this is by far the most famous: it attracts more tourists annually than the Golden Gate Bridge. Though having seen difficult times, for instance when unemployment was rampant in 1873 Chinese businesses were damaged and looted, and laws passed against the Chinese population, this Chinatown is a story of resilience and success. It’s seen as the place where Westernised Chinese food first made its way into the Western world, popularizing dishes like chop suey and dim sum – in fact, San Francisco Chinatown’s many yum cha (tea and dim sum) houses make for a great day of exploration, drawing many locals as well as tourists. 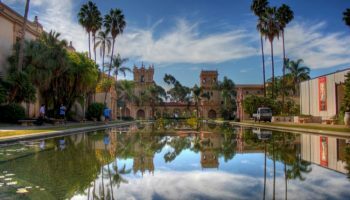 There are so many things to do packed into this dense area, including checking out the oldest Asian church in North America – Old Saint Mary’s Cathedral (1854) – and Tin How temple, the oldest Chinese Taoist temple in the US. This historic heritage mixed with great food – don’t forget the Fortune Cookie Factory – make this a really cool area to get lost in. Orchard Garden Hotel – This high-end hotel features spacious rooms decorated with a natural color palette and come with seating areas and soft carpets. At this 4-star hotel, you’ll find a lot of amenities, such as a rooftop bar with city views, an American breakfast restaurant, and even a gym. Orchard Garden Hotel is right next to the gate to Chinatown. The staff here are very friendly and helpful. Made up of just one square bordered by four roads – Geary, Powell, Post and Stockton Streets – in downtown San Francisco, there’s actually a lot packed into this dense area that serves as the city’s commercial heart. 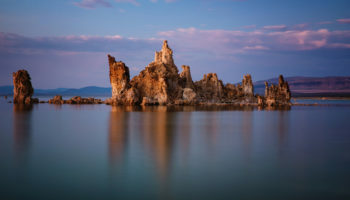 In fact there are many major hotels jammed into Union Square itself, meaning that there is a whole wealth of options to choose from, with as many moderately priced lodgings as there is luxury accommodation. Between the larger buildings – made up of office blocks, the aforementioned hotels, plus department stores to boot – you’ll find a number of upscale restaurants, boutiques, bars, and even galleries for your free time. This is a central commercial, shopping and theater district that you won’t want to miss out on. Plus there’s a major tourist attraction at the intersection of Powell and Market Streets: the manual cable car turnaround. Palace Hotel – Historic architecture and top quality service await you at this landmark hotel. Dating back to 1909, this place is all about the opulence of a bygone age. The rooms are sophisticated, there’s an opulent lounge with a stained glass dome, a posh restaurant, plus a pool and even three ballrooms. 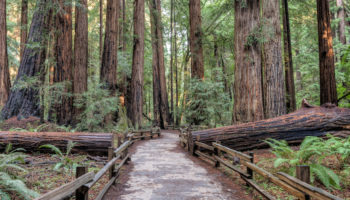 Location-wise, it’s well connected with public transport; the nearest Muni bus stop and BART stop are within easy walking distance. San Francisco Marriott Marquis Union Square – When it comes to chic, this 4-star hotel is a great option. Set in a high rise building with glittering views of the San Francisco skyline, it offers a bar, fitness center and spa, as well as a cocktail lounge on the 39th floor. 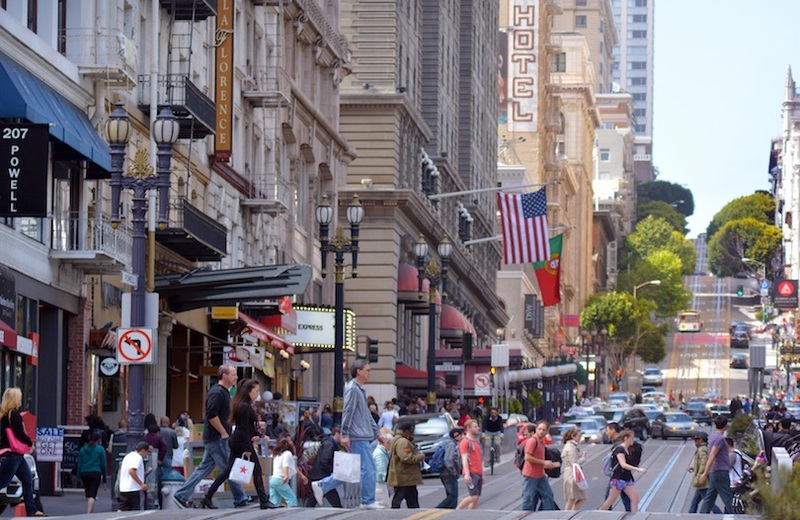 It’s less than a five-minute walk to the nearest BART station (Powell Street) and Union Square itself is nearby. Hilton Parc 55 San Francisco Union Square – Another one of San Francisco’s skyscraper hotels, this 4-star iteration of the Hilton is perfect for any shopaholic or foodie. Restaurants and shops quite literally surround this hotel and the Westfield San Francisco Centre Mall is just a couple of minutes’ walk away. In addition, Powell Street BART station is practically next door. The rooms are laid back and comfortable, plus you can find an American restaurant, a Thai restaurant, a coffee shop and a gym all on site. Beresford Arms – Set in a listed building, the Beresford Arms comes packed with many heritage features, starting with the sophisticated, Old World style lobby. There’s Victorian furniture, a chandelier and other tasteful decorative touches like a grandfather clock. The rooms are classic and spacious, and some come with kitchenettes. Free perks of the hotel include breakfast pastries and afternoon tea. Just a few blocks away, you’ll find Union Square, plus you’ll be spoiled for choice with the amount of eating and drinking options scattered around the hotel. If you’re a first time visitor to San Francisco, then the area of Fisherman’s Wharf is a great place to be in order to see the best sights and attractions that the city has to offer. Being a very much touristed area, there are obviously chain stores and tourist traps all around, but these you can spot from a mile away! A particularly impressive thing to do whilst here is to take a ride on the Sausalito Ferry on Pier 41, which takes 30 minutes to get Sausalito for a visit, and 30 minutes back. But the point is the journey itself: it’s one of the best ways to experience San Francisco Bay firsthand. In fact it was voted by the Society of American Travel Writers as the second best ferry crossing in the world. Elsewhere, check out Pier 39 to catch a glimpse of sunbathing sea lions up close, or hop over to Hyde Street Pier, where there’s a collection of historic seafaring vessels including the 19th century sailing ship Balclutha. 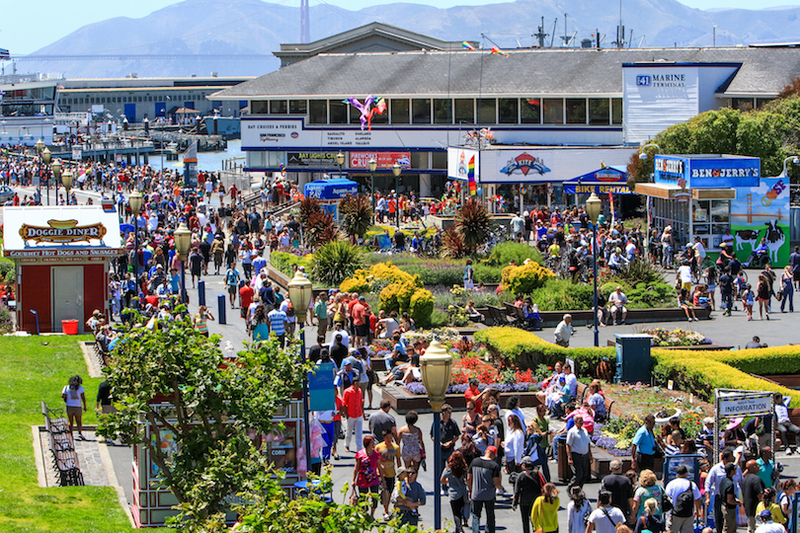 The various piers and buzzing seaside atmosphere of the place makes Fisherman’s Wharf a good place to stay if you like your cities always busy and definitively by the sea. Pier 2620 Hotel Fisherman’s Wharf – This modern hotel features trendy rooms that come with contemporary comforts like very large, 50 inch TVs and coffeemakers. Elsewhere at this decidedly upmarket hotel, you’ll find a refined wine bar where you can get small dishes to eat, too. But this cool hotel is also all about its ace location. 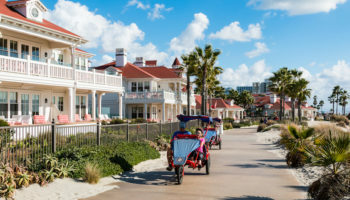 Ghirardelli Square and its food options are a few minutes’ walk away, Embarcadero waterfront is easily reached by the nearby streetcar, and Fisherman’s Wharf itself is less than five minutes away on foot. Hotel Zephyr San Francisco – The rooms at Hotel Zephyr are designed with a nautical theme in mind, suiting the Fisherman’s Wharf location. Naturally, the whole hotel is eclectic and quirky; even the windows are porthole-style and there’s fun artwork all over the place. The communal lounges at this 4-star hotel are large, plus there’s an outdoor terrace with its own street food van serving up tasty morsels and drinks. 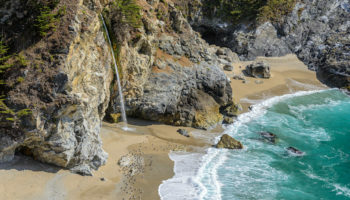 Just a couple of minutes from Pier 39 and Lombard Street, the location of this place is well placed for sightseeing. Adjacent to the popular tourist area of Fisherman’s Wharf is the idyllic area of Russian Hill. 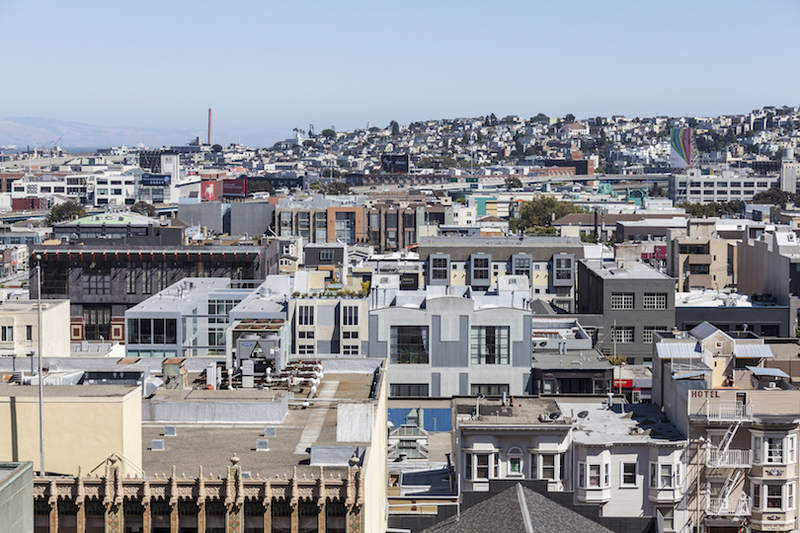 True to its name, this district is very hilly, and as such it can offer up unparallelled views of San Francisco and the bay below – and views like these, especially on a beautiful day, are hard to beat. 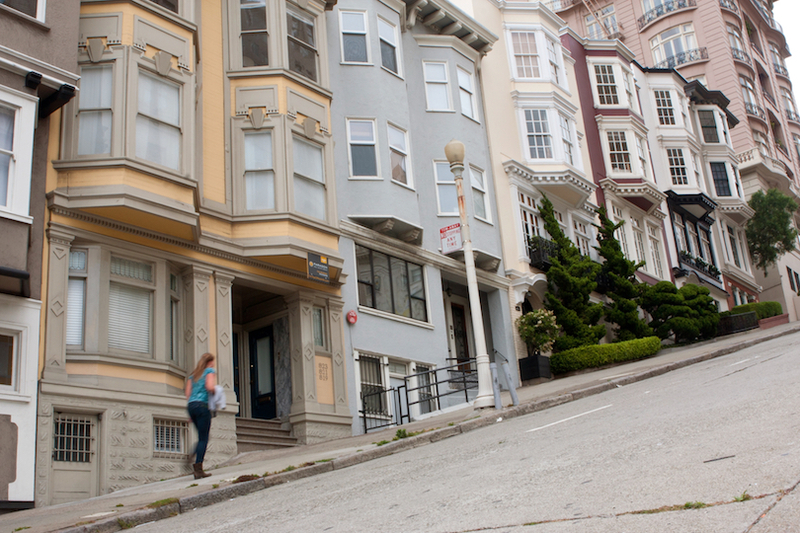 And it’s not just the vistas from up high that make Russian Hill a cool place to be, it’s the actual hills themselves. Yes, even the hills here are famous. You’ll know the infamous zig zags of the lush green Lombard Street, which is arguably a good candidate for the most famous street in the world. Then there’s Filbert Street, the city’s ‘steepest’ and often used for chase sequences in action films. Otherwise, Russian Hill is simply a beautiful residential area: there’s the intriguing Feusier Octagon House, built in the 1850s, the 1907 Engine House 31, and the impossibly green cobblestone walk that you can take along Macondray Lane, where you’ll feel at peace among the plants and flowers on each side of this pedestrian street. 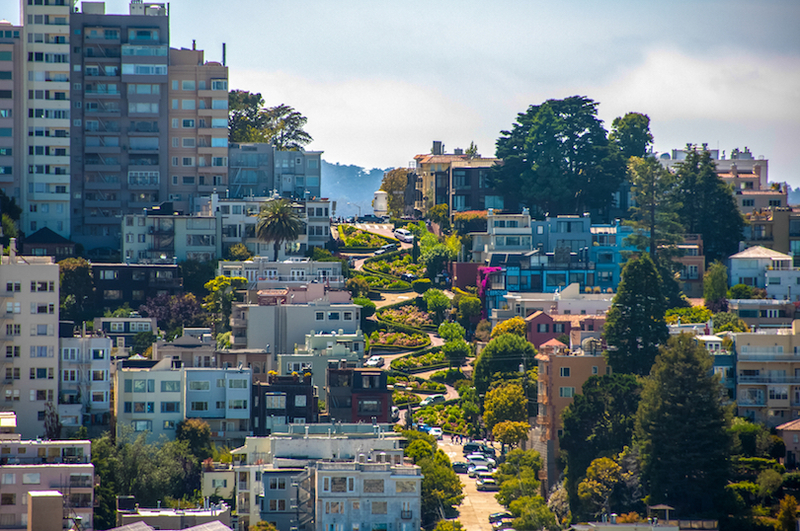 After prolonged walking around Russian Hill, you will be having more thoughts on living in this lovely area than you will of your next destination. Comfort Inn By the Bay Hotel – With top sights like Lombard Street and Fisherman’s Wharf within easy walking distance, this hotel is a good option for anybody who wants to get out and about on their San Francisco trip. The staff are friendly and helpful and serve up free, tasty waffles for breakfast every day. The rooms are decorated in a traditional style and come with dark wood furniture. Plus, there’s free coffee provided in the lobby at all times of the day. Synonymous with exclusive, Nob Hill was once home to the mansions of railroad barons. Today it has a wealth of immaculately kept streets and shopfronts, making Nob Hill the place to stay in San Francisco if you are looking for an area with a sense of class and privilege. Nob Hill itself was actually one of the original ‘four hills’ that made up San Francisco – but today, due to its rapid growth into a major east coast hub, the hills of San Fran number at 44. 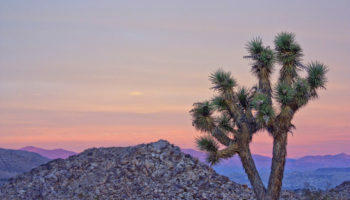 The prices around here can be about as steep as the hills that surround it, but that shouldn’t worry you because it’s not the sort of neighborhood that will be outdone in terms of its exclusivity. Historic Victorian homes add to the gorgeous sense of mystique that coolly drifts around this district, plus there’s the amazing gothic Grace Cathedral at its heart. The opulence in its streets, the bars at the tops of hills and the swanky hotels combine into an area for living it up, that’s for sure. Fairmont San Francisco – Set inside a wonderful historic building, this grand, historic hotel provides a high level of service for a supremely comfortable stay. The rooms come with heritage features like high ceilings, big windows, and balconies with incredible views across the city. On-site, you’ll find a restaurant that serves up Polynesian food, as well as a selection of other bars and restaurants to choose from. Catching the cable car from here to the Downtown district is easy, but it’s also close to the Grace Cathedral and other sights. Huntington Hotel – This iconic 5-star hotel takes as much inspiration from Singaporean Chinese heritage as it does from high-end fashion. The rooms are spacious and quiet for a comfortable and peaceful night’s sleep. There’s a relaxed atmosphere here, plus a romantic bar onsite. There is also a spa for even more relaxation and a hot tub, too. The Cable Car Museum is close by, so are Union Square, Curran Theatre, and a whole lot more in terms of San Francisco sights. InterContinental Mark Hopkins – This branch of the InterContinental hotel chain is set in a historic building that dates back to 1926. Of course, you’ll find high-end facilities here; there’s a casual restaurant along with a 19th-floor bar featuring live music. If you want to keep up with your workouts, there’s a fitness center here as well. The rooms are large and very comfortable. Easy access to the cable car means being able to get out and about to see the attractions this city has to offer. Known for its year-round pleasant weather and its even more pleasant views, The Marina is a coastal area of San Francisco that affords a wide vista of the Bay area. It’s one of the best places for running or cycling, or simply walking along, taking in the fresh sea air and the uncluttered skyline. There are a lot of green spaces spread along this area, making it feel especially separate and chilled compared to the streets and buildings of other areas further inland. One in particular, Marina Green, is quite famous for watching events like the 4th July fireworks display over the bay. You’ll be able to see the Golden Gate Bridge as you walk around The Marina, and from Aquatic Park you’ll be able to find a secluded spot to recline and marvel at the amazing views. 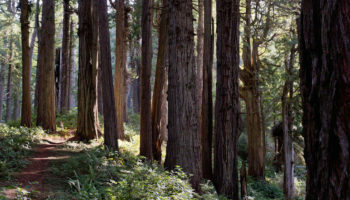 A small detour inland takes you to one of San Francisco’s newest and biggest parks, The Presidio, which is great to explore by bicycle. Chelsea Inn – This 3-star hotel features a great location in terms of public transport; there’s a bus stop just outside from where you can catch a bus right to the Golden Gate Bridge! It’s also surrounded by a load of high-end shops and restaurants, plus Union Street is nearby. The rooms are done in Mock Tudor style, are spacious, clean, and feature wood paneling and large wooden beds. This is a great option for an affordable stay in the city. Just to the east of the tiny area of Union Square is the true heart of business in the city, San Francisco’s Financial District. This area is home to the largest concentration of banks, law and insurance firms, corporate headquarters, and other financial institutions in the city. Skyscrapers dominate the skyline here, with the startling sight of the postmodern Transamerica Pyramid, jutting 260 meters (850 feet) into the air (though the Salesforce Building is taller, at 326 meters). But aside from the sleek revolving doors and suits of this corporate area is a wealth of things to do, from shopping in its many stores, to checking out the oldest restaurant in San Francisco (the 160 years old Tadich Grill), as well as the city’s historical red light district, Barbary Coast, there’s a lot more to the business end of San Francisco than first meets the eye – and plenty of places to stay, too. Loews Regency – Set in the top 11 floors of a high-rise building, you can expect amazing views of San Francisco and the Bay Area from this decidedly 5-star hotel. You can even see Golden Gate Bridge from the windows! There’s a bar, a posh brasserie, a gym, and a business center, so you don’t even have to move from the hotel if you don’t feel like it. However, the location on Pine Street means you’ll be close to a BART station, and there are tons of drinking and dining options nearby. Hyatt Regency San Francisco – Staying at this branch of the Hyatt in San Francisco means staying amongst all the fun of the Downtown district. 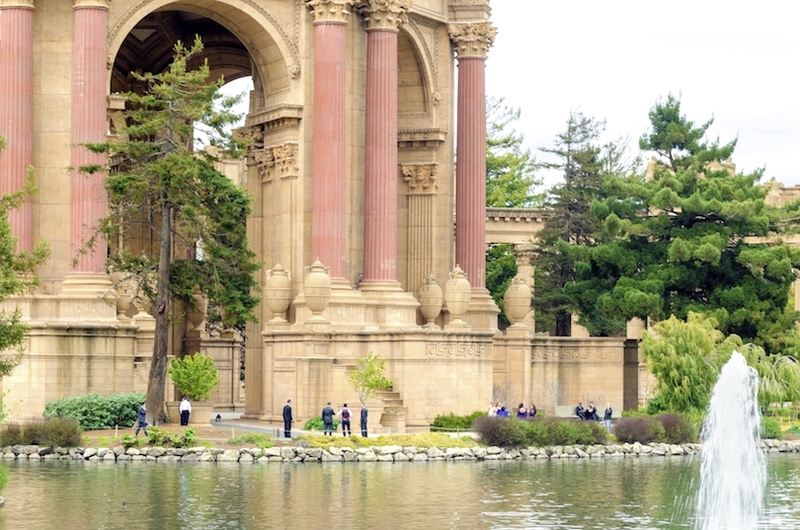 For a start, the Ferry Building and the Farmers Market are just a few steps away. The views are incredible – either of the city skyline or the bay – plus there’s a chic rooftop lounge for even better views – as well as a spot of breakfast, too. There’s also a bar and a restaurant on site. Club Quarters Hotel – This modern, 4-star hotel features small but clean and comfortable rooms and is surrounded by the impressive skyscrapers that this district is famous for. Some rooms at Club Quarters come with kitchenettes, whilst others feature their own terraces. Exercise equipment and iPads are available for hire. There’s also a gym, a coffee shop, and a farm-to-table restaurant. There are a lot of things to see and do right on the doorstep, such as music venues, the Punchline Comedy Club, as well as a cinema, bakeries, and a whole lot more in terms of food and drink. San Francisco has long been known the world over as a free-thinking, liberal area, and particularly for the LGBT community, and was important in the progression of the LGBT rights movement. Nowhere is this more evident than in the city’s foremost gay neighborhood, The Castro. A unique area filled with the rainbow flag and gay-friendly restaurants and other establishments, the gay community itself used to be more visible here – though gentrification has pushed them out somewhat. 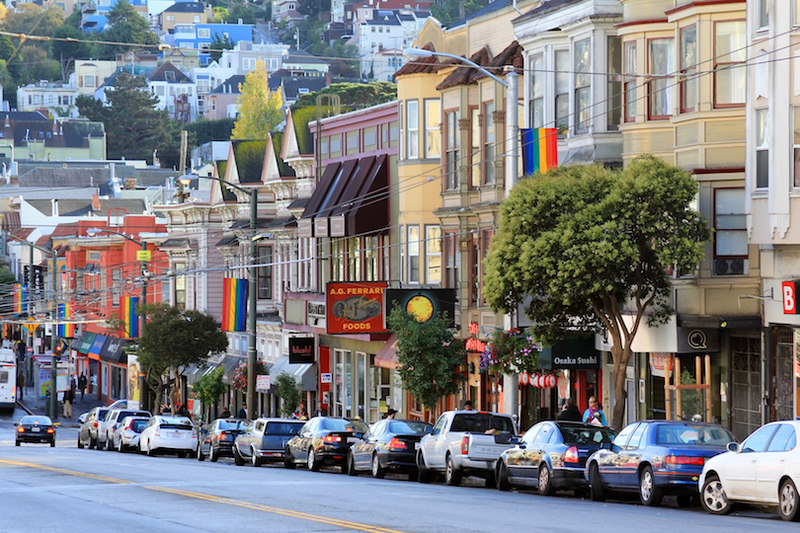 The historical center of the gay and lesbian community here is Castro & Market, and walking around from this point is a best bet for discovering this district of San Francisco. 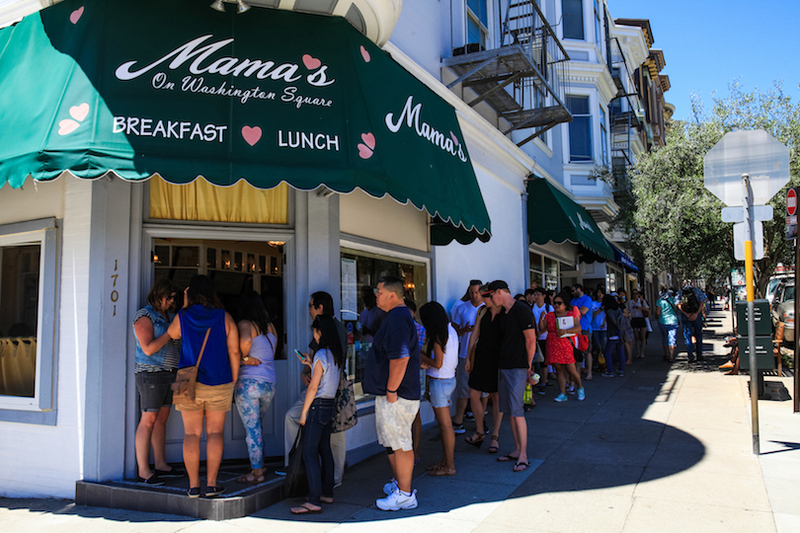 For instance following Castro Street to Market Street you will find many locals simply walking around doing their thing, with plenty of opportunities in the form of cookie shops, cafes and 24-hour eateries open for refreshments along the way. It’s still a vibrant, interesting area, especially if you haven’t really seen such fabulous streets before! 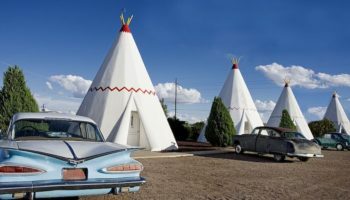 Beck’s Motor Lodge – With an exterior that looks like a classic American motel, the interiors here have been tastefully renovated for a stylish, simple, yet quirky and comfortable stay in San Francisco. The big communal balcony at Beck’s Motor Lodge is a great place to relax after a busy day of sightseeing. There’s free parking for guests, but at the same time, it’s conveniently located for public transport and surrounded by restaurants. Mission Dolores Park is close by. Known more colloquially as ‘The Mission’, this district of San Francisco has deep Latino roots. Dating back to the 18th century, the area grew up around Mission San Francisco de Asis (also known as ‘Mission Dolores’) – built by the Spanish in 1776, this is the oldest structure in San Francisco, and it gives the city its name. If you want to stay somewhere diverse and vibrant, this is definitely a good place for that. 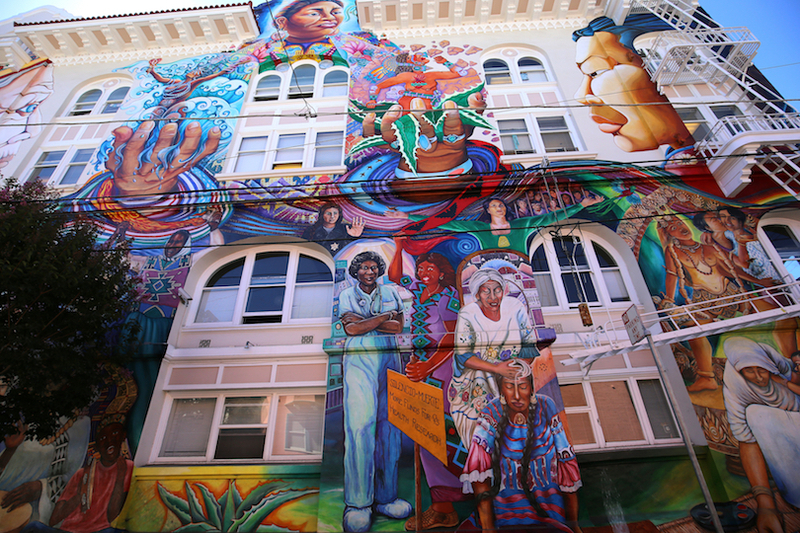 You can discover the area’s street art and the murals in Clarion Alley; chill out in Dolores Park, where on the weekend you’ll find picnicking hipsters and locals strolling through; search the colorful streets for new and exciting restaurants; and peruse the numerous of bookshops that Mission District boast. 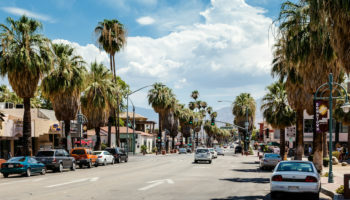 First and foremost, however, this area is mostly known for its Mexican community, and if you’re in need of a burrito – or other tasty snacks from south of the border – then Mission is the place to be. They come highly recommended. 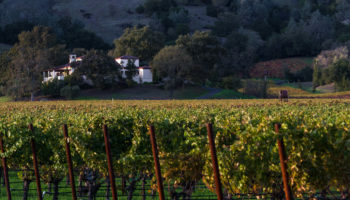 Inn San Francisco – Dating back to 1872, the cute, homely building that houses this hotel is done in a Victorian style. Everything here is decidedly vintage, from the antique furnishings to the classic décor; some rooms have claw foot baths, whilst others have four-poster beds. There’s even a charming garden to relax in. This hotel is located very near to a BART station and is not far from all the buzzing bars and eateries that the Mission District has to offer. This large area actually encompasses a lot of sub-districts, including the likes of South Beach, Rincon Hill and Mission Bay. It’s historically a vast warehouse filled region that is now seeing renewal with internet companies moving their offices here, and which is seeing a residential boom – particularly in Rincon Hill, which has been ‘rezoned’ and is fast becoming where those who work in the adjacent Financial District come home at night. 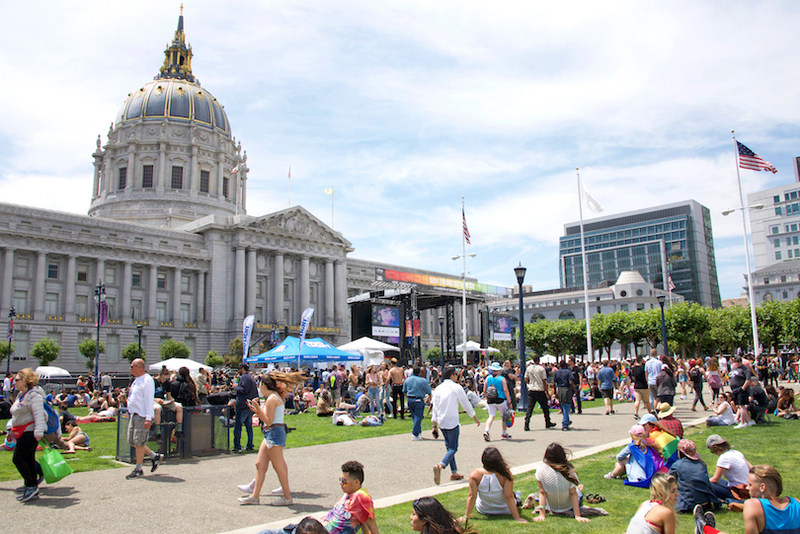 It’s in this area that the Giants play baseball in the AT&T stadium at the waterfront, and around the Yerba Buena Gardens is the Moscone Center – a convention complex – and the must-visit San Francisco Museum of Modern Art, or SFMOMA, amongst other museums and galleries. SoMa is on the up, and features a range of hotels from international chains to quirky boutique accommodation. The Park Central San Francisco Hotel – Set in a soaring high rise building, this hotel features a variety of rooms set over multiple floors. Located just a short cable car ride away from Chinatown and Fisherman’s Wharf, the whole hotel has been decorated with design details in mind. The rooms are simple but comfortable, and other amenities – like the bar – are very stylish. However, it’s the views that do the talking here; being in a skyscraper, the views of the city day or night are beautiful. This area is made up of two very different districts, one is the Civic Center, which as its name implies is the center of government in San Francisco. It’s here where you’ll find the startling white City Hall and the beautifully manicured Civic Center Plaza – the ‘Beaux-Arts’ dome of the City Hall, built in 1915, is particularly stunning. Alongside the government buildings, there are a number of museums in the area, including the Asian Art Museum. Here also you’ll find Little Saigon, where most restaurants and shops are Vietnamese owned – there’s some excellent food to be had here. Tenderloin is more of a mixed bag, since it is famously one of San Francisco’s most gritty areas yet to be properly touched by gentrification, well known for its dive bars, massage parlors, and adult shops. However, low rents and proximity to downtown has meant a few underground art galleries and trendy bars popping up in recent years. There’s not much accommodation in this area as such, but around the Civic Center there are many well established options. HI San Francisco City Center Hostel – This is a fun, friendly hostel which offers a sociable place to stay in San Francisco – on a budget, too. Set inside a historic building, staying here feels a lot more like staying in a boutique hotel, with lots of trendy features and vintage decoration. Offering dorms and private rooms, there’s a buzzing bar for drinks and snacks after a busy day of sightseeing. 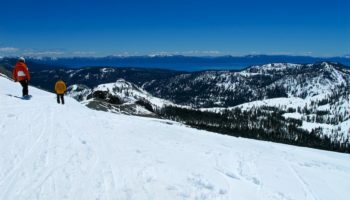 The hostel provides walking tours and activities for guests. Location-wise, the Civic Centre, City Hall, and the Asian Art Museum are just a few minutes’ walk away.